Last week we featured some of the work Pam did before she came to Atmosphere ID. 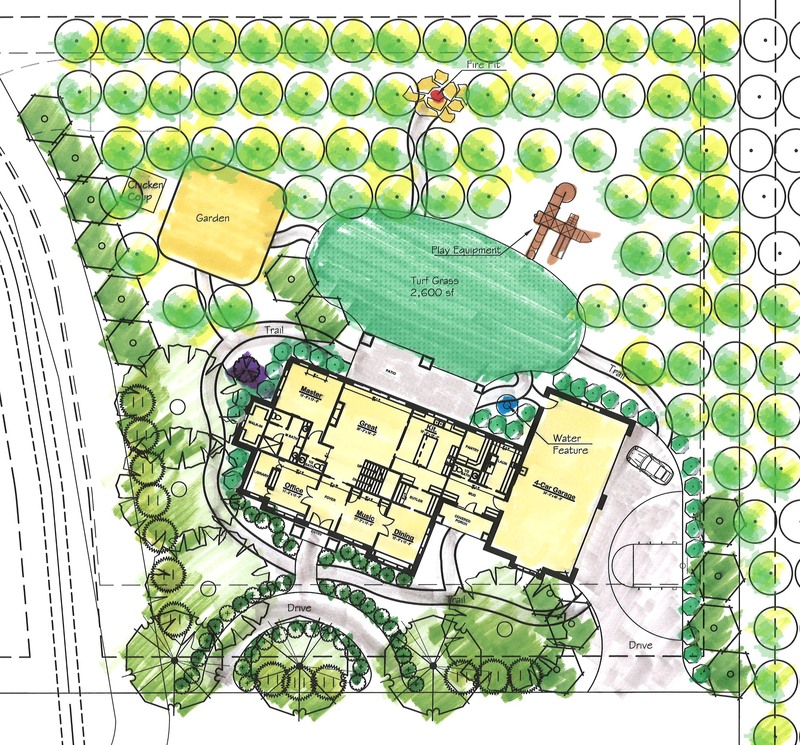 Today we’d like to introduce you to her latest project, a custom home to be built in Perry, UT. Construction should begin by the end of the month and we plan to chronicle the construction from start to finish here on our blog. Pam had the pleasure of working with the homeowners on a previous project and when the time came for them to build their “legacy house” they came to her. The plan was for Pam to design the floor plans and exterior elevations (which were inspired by a great two-story home with a cottage feel) and then bring a draftsman in to complete the construction documents and then have them stamped by an engineer. Once the first step was completed, we discovered that it was going to be way above their price range to build the house Pam designed. We had two options 1. To drastically reduce the size of the home and keep the original two story design or 2. Keep the main floor plan (which had everything on their wish list) the same and make the house a one story with a finished attic with dormers. Pam collaborated with Jamie Walker of Walker Home Design on the new exterior and upper floor plan. 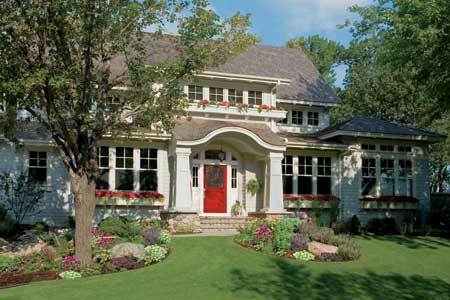 The goal was to design a charming cottage that looks as though it’s always been there, not like a brand new home. The house is being built on an apricot orchard and we wanted to preserve as many apricot trees as possible. 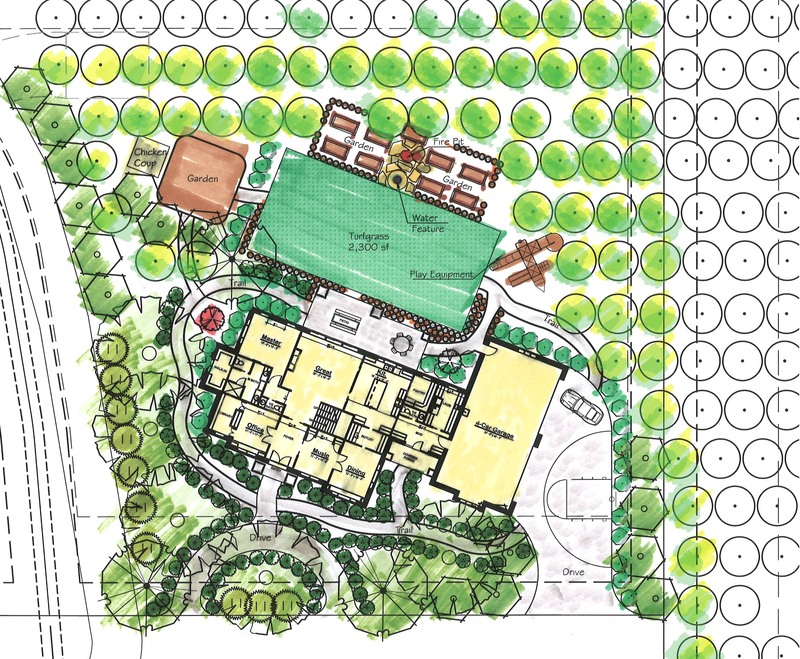 Because house placement played such a huge role here, Pam suggested bringing in a landscape architect to create a conceptual plan for the exterior. Jake Young of Three Men and a Shovel Landscaping came up with two great plans that capture the feeling we were going for perfectly. Both options include a driveway large enough for a basketball hoop, a charming circular gravel drive, fun path around the home, garden, chicken coop, firepit, and water feature. Option 1 is a little more informal with the firepit tucked away in the orchard. Option two is a little more formal and has raised planters surrounding the firepit and water feature. Which option is your favorite? Please come back and see how this home goes from concept to completion. This entry was posted in Exterior Design, Interior Design, Space Planning. Bookmark the permalink. Hi, Pamela, thanks for stopping by to take a peek at my new office. I am really enjoying it. Love this huge house, how pretty it is! And I like your chandy idea for the office space in the post below. Very pretty. I’m all about mixing old with new. All I can say is Pam is so very talented. The clients are thrilled with this project. What great teamwork with you and the landscape architect. Nice work Pam! By the way…I think I like the first less formal option. Both are great, but that would be my pick. It’s more imaginative and exploring. Wow! I love this house! I think option one is great! I love the idea of going out into the orchard to sit around the fire! I am going to be daydreaming about that one all day!